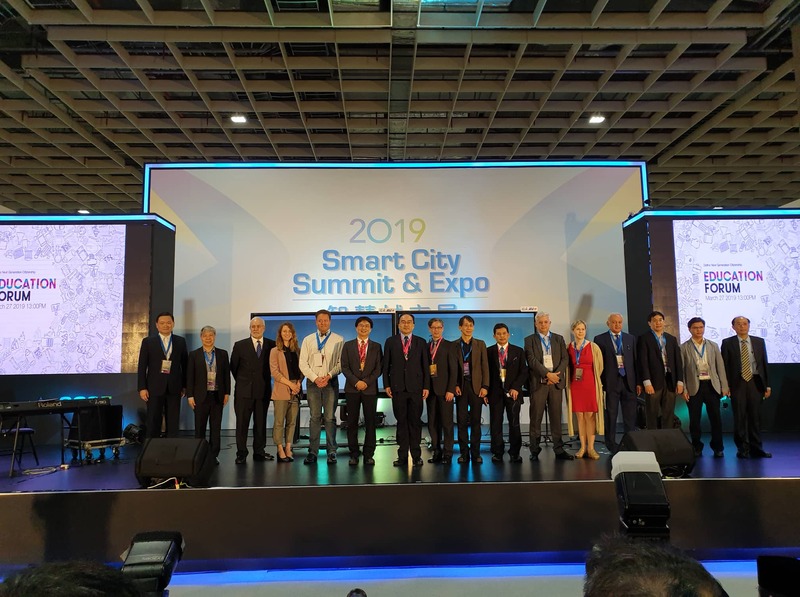 The Education Forum was held at the Smart City Summit & Expo in Taipei on the 27th March 2019. With the key focus on understanding how Smart Education impacts today’s world, key leaders and experts in the industry shared their experiences and thoughts on the landscape. With the fast-moving landscape in a world that is disrupted by the latest technologies, information decay (the idea how value of information diminishes over time) has been accelerating. Therefore, what is taught today will be worth much less in five years’ time, when compared to the past. Obviously, there is a desperate need to change the education system in the world to keep up with this trend. Instead of traditional methods of education, it could make more sense to work towards instill curiosity and “learning how to learn” concepts in the new generation of learners. Smart Education technologies comes in to play to aid traditional education methods, while at the same time, create interactive and engaging experiences for learners to stimulate their curiosity. This helps learners to build resilience and self determination to find out more about certain topics which they could be interested in, and grow interest and passion in certain topics. With smart education technologies, resources to information is also more accessible than ever, propelling independent education. However, it is sad to say that many education institutes and schools still have a misconception with the concept of adopting Smart Education technologies. They think that just by purchasing IT equipment and having the infrastructure in place, they have sufficiently achieved the advantages of Smart Education. However, most of the times, such poorly planned adoption of technology leads to a waste of resources, and defeats the purpose of having them in the first place. There is a need to properly inform, train, plan outcomes and execute strategies in order to maximize the outcomes with the adoption of technologies. For example, by purchasing iPads for a cohort of students, but failing to teach the teachers how to use it reduces the overall quality of education. So is not having proper software on the iPad that aids education. It could likely be that such an adoption causes more problems to its organizations than advantages. Therefore, adoption of Smart Education technologies must be properly planned by organizations. These technologies are already ahead of its time. There are many different kinds of technologies available in the market, but due to the lack of change to the current education system, and perhaps the costs and ideologies involved in such changes, many are reluctant to make the change. There must be support from all stakeholders in education in order to transform education to catch up with technology. The government, education institutions and its leaders, teachers, parents, students must come together and find out what is best for the education of tomorrow. Of course, while speaking of all these ideas abstractly, different governments and countries will have a different understanding and priority for what is required for Smart Education. We had a chance to speak to Prof Dr Ali Ghufron, who shared his views on Smart Education for Indonesia. In Indonesia, the adoption of Smart Education is focused on the objective of getting quality educational resources to students of all background. They have started their efforts in bringing MOOC (Massive Open Online Courses, both accredited and non-accredited) online for their institutes of higher learning, and will be rolling them out to other education segments as well. As what we understand, the Indonesian government focused on bringing data connectivity towards every single area of the country. This is done to bring all the educational resources along with it to students. It has always been a challenge to connect up a country with thousands of islands. They have constantly been pushing the use of technology to change the way how education is conducted, and rallying their citizens to be open to these new technologies through various traditional and new-age media channels. When asked if the importance of teachers in the future of education will wane, Dr Ali confidently said that teachers can never be replaced. While technologies will change the way of how education content is accessed, teachers will only become more important to teach “humanity” to students. They are moral leaders for students and will be there to inculcate values and morality which should never be replaced.